Live! 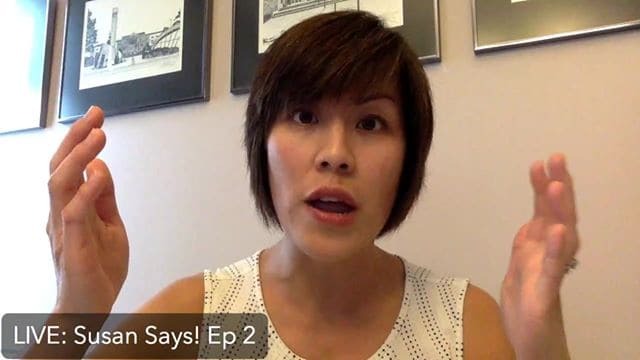 Susan Says: Ep#2 – The #1 reason why most entrepreneurs work harder than they need to. Hey there! Tuning in for a few as I got to run in a minute but I will watch the replay. Thanks for joining me! I appreciate you taking the time. I was so excited to see you too!! Yay! So glad technology worked for me today. Phew!! Oh I’m glad the example made sense. I always try to pick something simple. Preach! That is so true! The time factor is challenging for us all! Time is our most precious resource! It’s so challenging to use it wisely. Thank you for your kind words. I hope it was helpful. Sorry for the crazy connection! Enjoy everyone! I gotta run but will circle back because this is huge! It’s a pretty big topic but I’m trying to keep these shows short and to the point. Thanks for joining in and let me know if I can expand on anything for future show topics! Hi Carla! Thanks for watching! Hemali Lala this is a good one to chime into! Follow Susan if you’re not already! Hemali aw thank you so much! You are amazing too! No I haven’t kept track of numbers. I look but I need to do that. Yes the tracking will help you to see patterns and assess what the numbers actually tell you so you can take different actions to move your business forward. Kudos to you for at least looking at your numbers. That’s a great first step! Hey Jennifer! Thanks for watching. Replay. Awesome information, and I’m thinking how to simplify. #replay This is good. Looking at the numbers intimidate me but they help so much.